Stafford County was organized on July 2, 1879, by John Birkbeck; Martin Fitzpatrick; James O'Connor; Elisha, Edward and F. Williamson; Abraham Lash; H. Campbell; J. C. Stone; R. M. Blair; Jesse Vickers; E. D. Crawford; Edwin Hadlock; W. Z. Nutting; George C. Ardry, and W. R. Hoole. It was named for Captain Lewis Stafford, a Civil War soldier in the First Kansas Regiment, and contains the cities of Radium, St. John, Macksville, Hudson, Seward and Stafford. The Church of Christ established in the Ardry settlement in 1874 was probably the first. The Zion Valley Mormon Church was established in St. John in 1875. The Hoole School, Lincoln Township, is believed to be the first school district, established October 10, 1880. The first county fair was held in St. John, October 12-14, 1910. Dr. C. A. Ruggles, who settled in the county in 1896 established the first public hospital in Stafford County. The 50-bed hospital was the largest in western Kansas. The novel, Chaff in the Wind, by Edna Walker Chandler, is based on a family farm near Macksville. Interesting sites in the county include the Peacock and Soice Building, the Larabee Memorial Library, the Henderson House, the Weide House and Opera House, the Brinkman Hotel, the Jones Building, (the original Jones Store), the Omar Norton House, the Cornwell House, the Shank House, the Zion Valley Church and the Tudor Building. 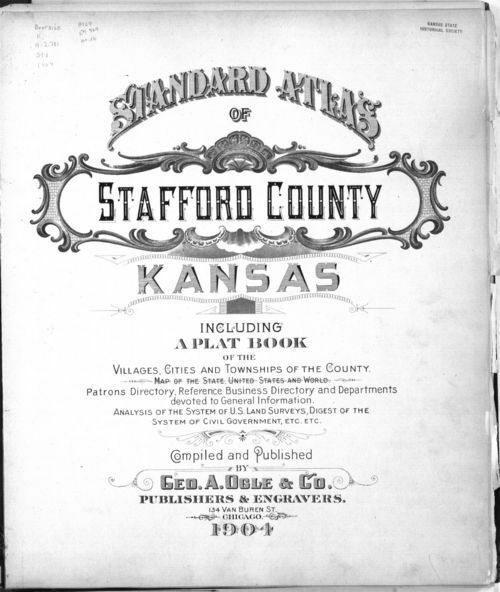 The Stafford County Museum, the Larabee Memorial Library, and the Ida Long See our Kansas Counties database for statistics in the county. For more information see the Stafford County website. Goodman Library in St. John have historical reference materials on the county's history.